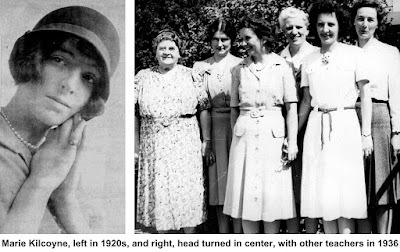 Ridgefield has had many teachers with long careers in the classroom, but few if any in the 20th Century matched Marie A. Kilcoyne, a native daughter who taught for 50 full years, 43 of them in Ridgefield. Marie Ann Kilcoyne was born in Ridgefield in 1907 and started her education here as a pupil at Titicus School, then went to the East Ridge Grammar School and graduated in 1925 from Hamilton High School on Bailey Avenue. After two years of study at Danbury Normal School (now WestConn), she taught in Easton for seven years, starting in 1927. She came to the old Branchville Schoolhouse in 1934, teaching first through fourth grade in one room until 1939 when the school was closed. She moved to the Garden School, once the high school she had attended as a teenager, and taught second grade. When Veterans Park opened in 1955, she continued as a second grade teacher there the rest of her career. Kilcoyne died in June 2000 at the age of 93.